Pumpkins look great on the doorstep, but they’re also perfect for the dining table, baked after being stuffed with rice, cheese, herbs or, well, just about anything. WHEN I WAS a kid, occasionally we would find an enormous zucchini in the garden, one that had been undiscovered beneath broad leaves. My parents would cut the several-pound squash in half, scoop it out, fill it with rice, cheese and herbs and roast it in a pan with an inch or so of water. “Cheese boats,” they called them. Creative as that was, an overgrown zucchini doesn’t look especially appealing on a dining table. The perfect squash to star as centerpiece at Halloween or Thanksgiving is the ever-lovable pumpkin. It’s not just a decoration for your doorstep. Festive and attractive, pumpkins are delicious to eat filled with a savory cheesy stuffing. The soft, sweet flesh lends itself to practically any seasoning and style. My favorite version was inspired by childhood, with rice, cheese and herbs, although with today’s sensibilities I might substitute quinoa or farro. For a decadent dish on chilly evenings, Dorie Greenspan’s Pumpkin Stuffed With Everything Good — bread, Gruyere and bacon — is unbeatable. With a rich herb stuffing and sweet squash combined, it’s the best of Thanksgiving all in one dish. A pumpkin is so versatile, anything goes. Make it vegan with vegetable stock or wine instead of cream, or gluten-free with rice or quinoa instead of bread. For vegetarian versions, fill it with chard, kale and mushrooms. Meat lovers can bring on the bacon, sausage or prosciutto. Add cranberries or nuts if desired. Whatever your pleasure, just make sure the filling is moist before you put it in the oven. Serve the pumpkin directly on the baking dish to avoid transferring. Either scoop out the filling with the meat of the pumpkin or cut through the whole thing and serve slices. 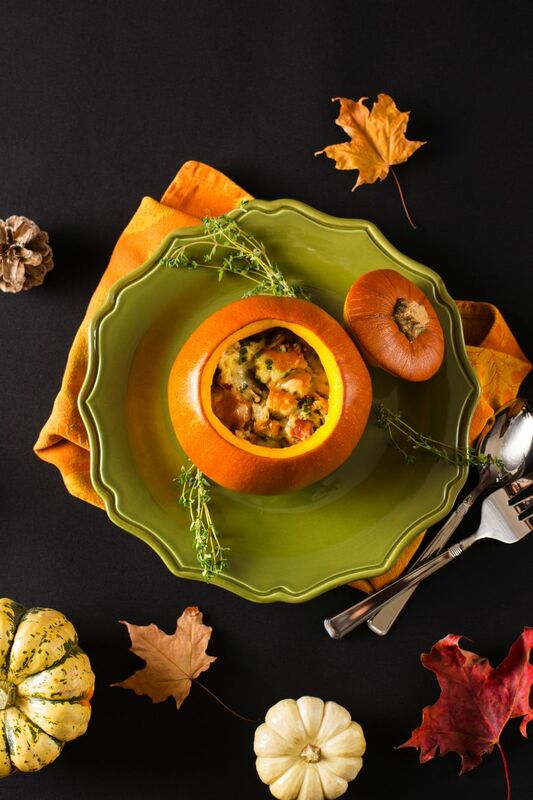 What could be more inviting on a fall table than a pumpkin? 1. Center a rack in the oven and preheat to 350 degrees. Line a shallow baking pan with parchment paper. 2. In a saute pan over medium-low heat, cook the leek in the olive oil until soft. Add the garlic and cook another minute or two. Turn off heat. 3. With a sharp, sturdy knife, cut a cap in the top of the pumpkin large enough to get your hand through, as if you were carving a jack-o’-lantern. Scoop out the seeds and strings from inside the pumpkin. Sprinkle the inside generously with salt and pepper. 4. Toss the remaining ingredients together in a bowl. Add leeks and garlic. Season with pepper. Taste to see if you need to add salt. 5. Pack the mixture into the pumpkin. Depending on the size of the pumpkin, you might have too much or too little to fill to the top. Put the cap on the pumpkin and bake for about 1½ to 2 hours, until the stuffing is bubbling and the flesh of the pumpkin is tender when pierced with a fork. If there is excess liquid under the top, remove the cap and bake for 15 more minutes. 6. Carefully transfer to the table and serve by slicing or scooping out the filling and pumpkin together. Adapted from Dorie Greenspan’s Pumpkin Stuffed With Everything Good. Catherine M. Allchin is a Seattle freelance writer. Follow her at catherinemallchin.com and on Instagram @catherine_allchin. John Lok is a Seattle Times staff photographer.